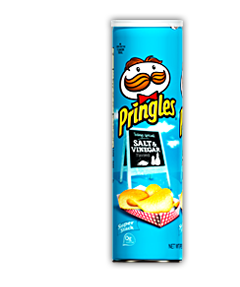 There is little to say about the Pringles canister. It is among the most famous food packaging in the world, the saddle shaped snacks, stacked in the canister is the basis for all of the product's success. The tubes are flavor color coded. That's it. Food packaging perfection. You will not find us describing Pringles as Chips or Crisps on these pages, however the lobbyists and courts may describe them. The reconstituted nature of the snack featured a superb initial crunch, but they quickly turned mushy. These snacks are very easy to describe. They are famously saddle shaped. The surface was bumpy but smooth. The colour was a very pale yellow that, if it were paint, would be described as 'White, with a hint of yellow.' There was also a lot of pale powdery seasoning. A Nose Plunge Test revealed a very mild Vinegar aroma. The real taste came with a Chip Licka Test which saw the snack feature a tart Vinegar taste. This was not wholly replicated in the taste, which although featuring a distinctly obvious Salt and Vinegar flavouring, it was mild and quickly overwhelmed by stodgy potato once the eating process was under way.